David Chang is a Korean-American chef who runs the Momofuku restaurant empire in New York City. To say he’s a big deal is an understatement. His restaurants have been visited and recognized by just about everyone. His food is by no means distinctly Korean; it’s influenced by Japan and Korea, as well as the American South, France, and of course New York. 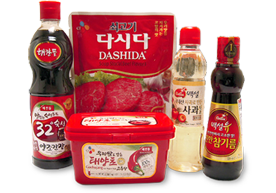 David’s Korean heritage, though, remains a loud voice in the chorus of all these cultures. Kimchi, for example, comes up in different guises all over his menus, and his kimchi butter is so delicious that it’s tempting to eat it just on its own. Influenced by David, this simple compound butter makes ordinary grilled steak unforgettable. Using a fork, mash the butter with the kimchi and kimchi liquid until thoroughly combined. Place the butter on a large piece of plastic wrap and form into a log, using the plastic to help you. Refrigerate the butter for at least 1 hour before using (although you can store it up for up to a week tightly wrapped). Preheat a grill to high or preheat a ridged cast iron grill pan over high heat. Sprinkle the steaks on both sides with the red pepper powder and plenty of salt and black pepper. Drizzle both sides with the sesame oil. Grill about 4 minutes per side (depending on the thickness) for medium-rare. Transfer the steaks to a cutting board, cover loosely with foil, and allow the steaks to rest for at least 5 minutes. To serve, cut the butter into 4 coins. 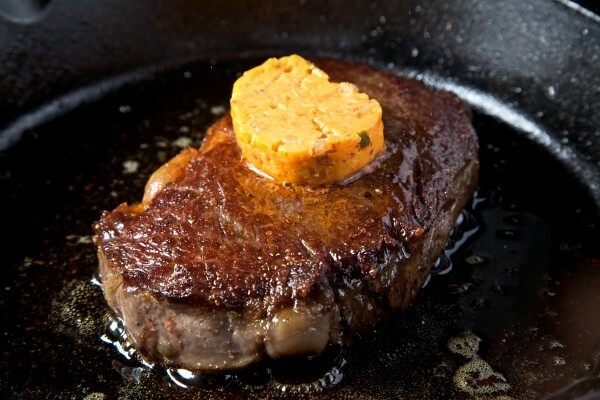 Top each steak with a coin of butter and serve immediately, letting the butter melt over the steaks.